Runners up on home soil in 2010 in New Delhi but no podium reservation four years ago in Glasgow, India booked their place in the final of the Women’s Team event at the Gold Coast 2018 Commonwealth Games on the early afternoon of Sunday 8th April. 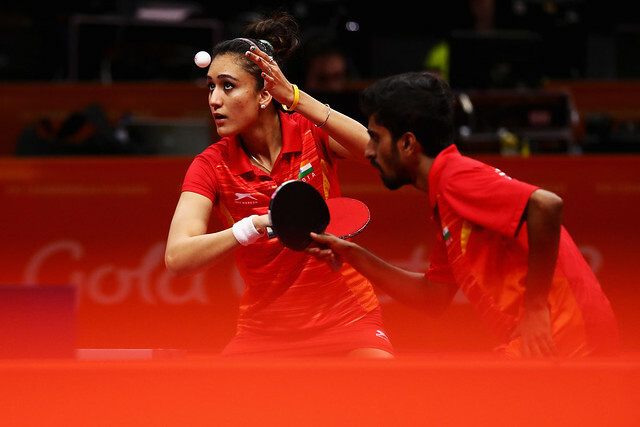 Manika Batra, facing an adversary who was no stranger, set India on the road to victory; at the recent 2018 ITTF Challenge Polish Open in Spala, she had beaten Kelly Sibley in four straight games (11-5, 11-6, 11-8, 11-8). In Gold Coast life was more testing for the Indian, she lost a close opening game but then combining her blocking skills from the backhand, the side of the racket on which she uses long pimpled rubber, with an efficiently executed forehand top spin, she recovered to secure the next three games (9-11, 11-7, 11-5, 11-7). Notably when trailing 3-4 in the fourth game, Kelly Sibley called “Time Out”, it was not to yield the result for which England hoped. India held the lead. Defeat in four games for Kelly Sibley, it was to be the same margin of defeat for Tin-Tin Ho in the next match on court. Two games to nil in arrears against Madhurika Patkar, trailing 5-6 in the third, Tin Tin Ho elected for “Time Out” but at 9-10 she faced match point; determined she won the next three points to secure the game but it was not to spark a memorable recovery. Madhurika Patkar established a one point lead in the fourth game at 6-5; Massimo Costantini called “Time Out”; the move proved prudent. At 10-7 Madhurika Patkar held three match points, the first was saved, not the second, a four games win was secured (11-7, 13-11, 10-12, 11-8), India held a telling lead. Success for Madhurika Patkar, soon after there was further success, she partnered Mouma Das to a doubles win against Kelly Sibley and Maria Tsaptsinos. The pattern of the previous singles matches was repeated; a four games result with the “Time Out” taken by England at 7-6 in the second game bearing fruit but it was to be no more than consolation. Mouma Das and Madhurika Parkar were not to be denied, the third and fourth games were secured in style (11-7, 8-11, 11-7, 11-1). England now meets Australia in the third place contest; India faces Singapore to decide top place. Both contests will be played later in the day, the bronze medal match at 4.00 pm; the gold medal contest at 6.30 pm.